Background: Dr. Ross Nash is an internationally-recognized cosmetic dentist. Located in the Charlotte, NC, area, Dr. Nash has rejuvenated the smiles of many celebrities and beauty contest winners. Problem: Over the course of 20 years, several different Internet marketing companies had managed the online image of Dr. Nash’s private dental practice, but with limited success. Dr. Nash needed and wanted a POSITIVE change. Solution: Beginning in the spring of 2016, Ceatus began reshaping Dr. Nash’s online strategy and footprint. 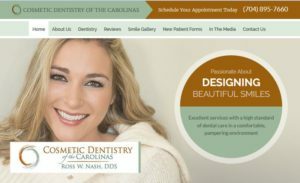 In the ensuing months a stunning new website was launched which projected Dr. Nash’s true reputation as a world-renowned smile makeover expert and incorporated actual patients from Dr. Nash’s successful career, including the recent winner of the Mrs. North Carolina pageant. New SEO strategies were implemented to more effectively build his rankings and traffic on Google as well as the other search engines. The practice also implemented the new Ceatus Review Manager program, which had the effect of creating a highly positive online reputation footprint for Dr. Nash. He then capitalized on this powerful reviews strategy to generate new patients. Results: All of these elements immediately began to boost the number of incoming phone calls for high-end veneers cases. These new patients had similar comments when Dr. Nash and his staff asked how they had heard of the practice. Many said they searched online using terms like “dental veneers” or “smile makeover,” found Dr. Nash’s beautiful new website, read his reviews and then called his office to schedule an appointment. The growth in new patient cases has been so pronounced that the practice posted its best revenue month ever in October 2016. This success is due to Dr. Nash’s great skill, experience and outstanding patient results, and the development of a comprehensive strategy to harness his outstanding reputation and communicate it to prospective patients online. Congratulations to Dr. Nash and his team for great patient outcomes and success with the new online image.